. [ t i m w y l i e ] . xanga.r [18-May-2007] - This is a program written in rebol that parses xanga pages to get the post and comments. 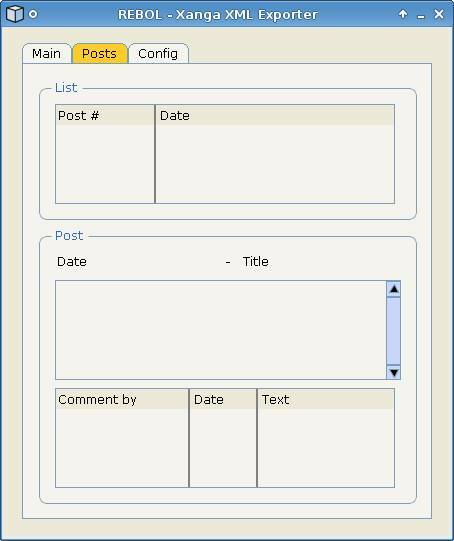 Then it can output them in the wordpress rss 2.0 xml format for wordpress to import. All posts and comment dates/times are preserved. Does not get currently listening/watching/reading header items, and sometimes only gets them and misses the post. Code Use - The code is written in rebol and so the object must be used with rebol. From the rebol console the code is below. There are also refinements on export-wpxml to specify the new wordpress site url and to specify the title of the site. xword.r [18-May-2007] - This is a gui wrapper for the xanga.r script. 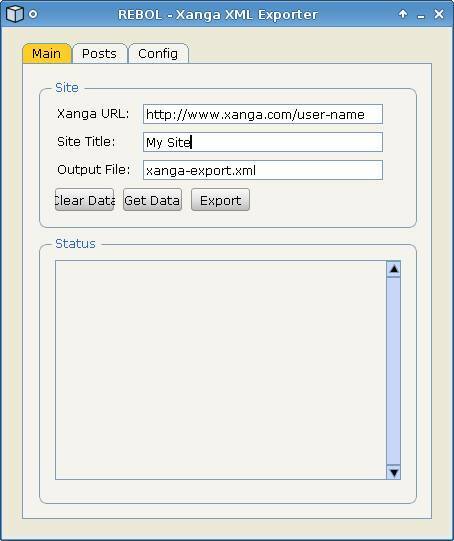 In order to run the script you must have the xanga.r script and the latest version of rebgui.r. I am also providing a windows and a linux binary version if you don't want to run the script. 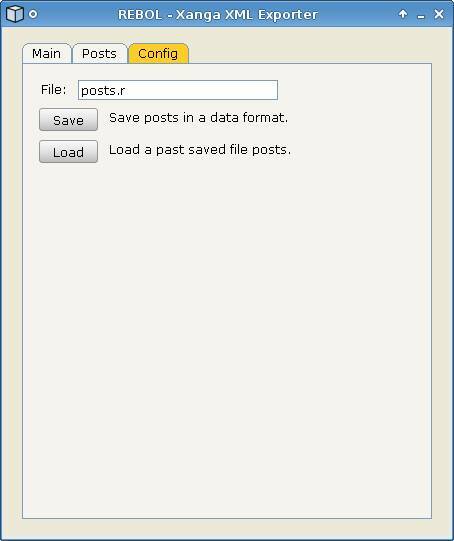 To export the wordpress file: type in a file name and click "Export"
To save data for the future click the "Config" tab and click "Save"
August 24, 2007 - Fix bug in comments, changed format for saving posts.r file and reading. Not compatible with older versions. Can change update file by running rebol script below updates. January 2, 2009 - Some formatting changes have happened on xanga, so I'm leaving the original and adding the new in case these changes aren't universal. The xword program only uses the old version though. April 22, 2009 - Xanga changed their url scheme which messed up all the links in the script. This has been corrected in the latest xanga.r file. September 18, 2009 - Xanga is now attaching the comment id number in the div tag. This version is simply has one line commented out.